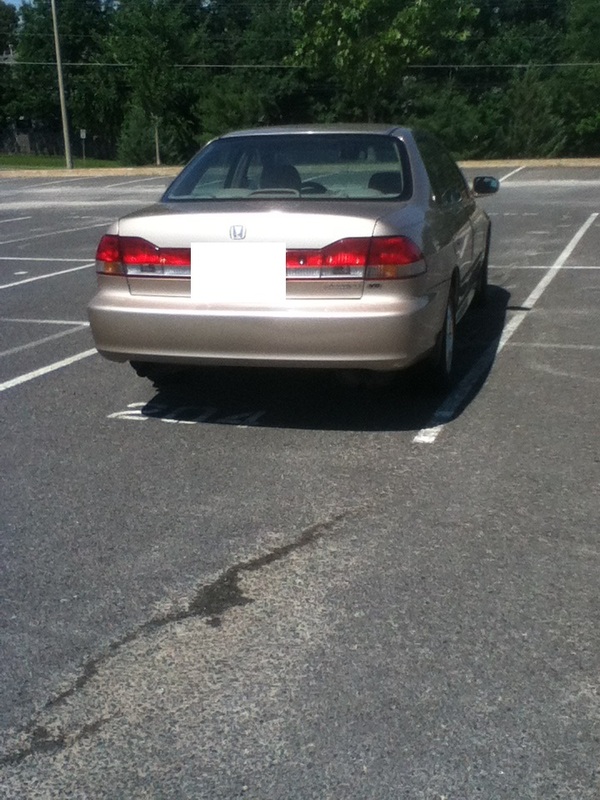 How I parked in front of my old high school after driving on my own for the first time. I guess it could be worse. Yesterday I drove to Barnes & Noble twice. Going out on my own – and throwing a mini-dance party every time “Problem” by Ariana Grande came on – made me realize how driving creates such a strong feeling of freedom. With a full tank of gas you can go almost anywhere, at any moment. Having a car makes it so much easier to buy groceries, have illicit affairs, and blast pop music, amongst other unrelated activities. But, as I mentioned in a post a few months ago, I’ve never paid much attention to the idea of a physical home. Throughout all my travels, either in my daily life or inside my own head, this blog has served as a safe space for me to share my thoughts for three and a half years. No matter how far I go, I will always have my readers to thank for letting me know that I’m not alone. I remember wondering whether I should make The Quiet Voice private when I was applying to colleges, and here I am, reflecting on that concern after completing my first year of university. Just like my hair when I roll the windows down and drive faster than 50 mph, time sure does fly. 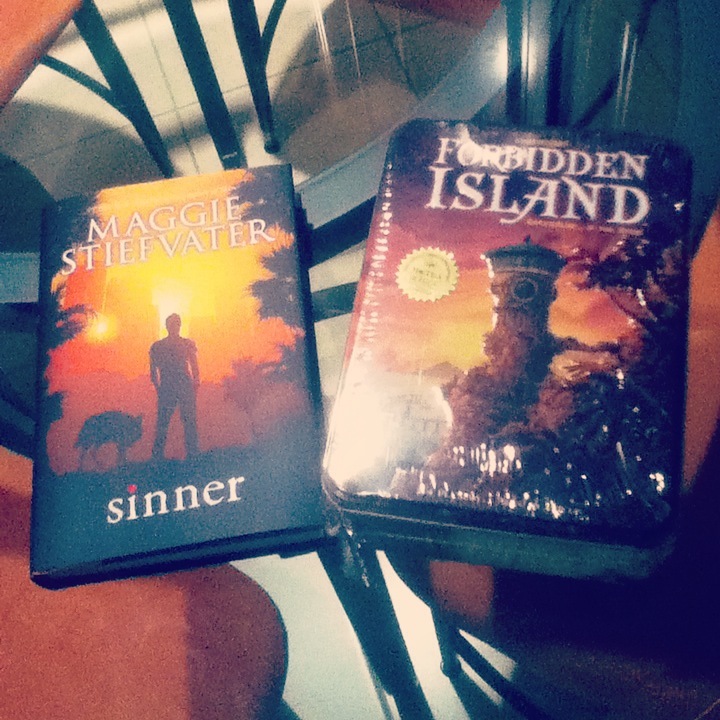 My purchases from B&N: Sinner by Maggie Stiefvater and the board game Forbidden Island. Anyone recognize or appreciate either of these two? Two questions for you guys: 1) If you had to give someone just one driving tip, what would it be? Because I just earned my license a few weeks ago, my answer would be pretty nondescript, something like checking over your shoulder when you change lanes or making sure not to get too distracted by the thought of books while on the highway. Also, 2) For those who don’t drive – or just want to answer – what’s a great book you’ve read recently that you would recommend? Speaking of books, if you want, you can read my reviews of Guardian by Alex London and Hushed by Kelley York here and here respectively. Hope you’re all having a wonderful Wednesday and a fabulous week! I don’t drive, so I don’t have any tips on that, but I just read ‘Just Kids’, by Patti Smith, and it is my favorite book on earth right now. I don’t know if you’ve already read it, but if you haven’t, YOU MUST, RIGHT NOW. Thank you for the recommendation! It doesn’t look like anything I’ve read before – besides the fact that it’s a biography/memoir – so I’m interested in seeing how much I like it. Oh yes, advice. Try to remember that there are a lot of idiots on the road and account for that in being a more careful and responsible driver. Is an Automatic License easier to obtain? I feel like although you have to put in so much effort, that amount of time might be a good thing because it exemplifies how seriously Australia takes road safety. Your advice makes sense too – one of my close friends always says it’s not the driving that messes you up, it’s the environment (including other drivers). Thank you for reading and commenting! Automatic driving takes out the need for a gear shift and allows me to bypass the hurdle of stalling – so yes I’d say it’s easier I’m that sense but I still have to learn all the manoeuvres before the practicals so wish me luck on that. How does getting your license work where you live? Thank you Gemma! Yes, bookshops are the best. Hope your week is going well, too. Congrats on getting your license. I don’t drive, so glad you gave me another option to comment on. I should probably check your Goodreads before reccomending anything, but the books that have really affected me most recently have been Cloud Atlas and (not so recently) Infinite Jest (which is kind of where I got my blogging name from). Oh snap, two classics I’ve heard great things about. Thank you for your recommendations, for reading, and for commenting! Hi, Thomas! Congrats on the views milestone and on getting your license. My driving advice: If you haven’t already, learn to drive a stick shift. It’s easy, it’s fun, it teaches you a lot about cars, and makes you really cool. Best part is that stick shift cars are much more common than automatics abroad, so that gives you wheels ANYWHERE. It’s a great feeling. Great advice Rebecca! My uncle actually offered to teach me to drive stick shift, so perhaps I will pick it up later in the summer. I’ve heard frustrating things about learning but you make the benefits sound worth it. Thank you for reading and commenting. Driving gives you such freedom! Congratulations! I suppose I like to get where I’m going as fast as anyone else. But seriously …. go faster doesn’t always get you there faster or at all. I think the best thing you can do is every time you sit in the car, be calm. Make it your place to never be in a hurry from. That’s when mistakes are made. You’re right, Colleen. Patience is a virtue and that applies to driving too – speeding is definitely not a good thing. The idea of driving connects with one of your posts you recently published, ha. Thank you for reading and commenting! Congrats on the views and on getting your license! I’ve been driving for several years now and I have a love/hate relationship with it. I agree that the freedom is nice, but you can’t forget the responsibility that comes with it (you are operating a “screaming metal death trap” as one of my friends puts it). Anyway, if I had to give one tip it would be to remember that you are sharing the road with other people and you have to work with them. That seems obvious, but you’d be surprised how many people seem to forget to pay attention to others, use their signals, and follow through on their maneuvers. Do not be that person who sets their right turn signal, realizes they made a mistake, and suddenly veers across three lanes of traffic to turn left (I’ve seen it happen). It is always better to pull over or turn around than to do stupid things like that. And I agree with the person who said to remember to be calm and to never be in a hurry. That is sage advice. So true – even though freedom is nice and fun, it’s important that it comes with a ton of responsibility. I agree that we should keep in mind how dangerous cars actually are and to pay attention to those around us, because in several circumstances it takes two to create a serious accident. Thank you for reading, commenting, and for your advice! Congrats on the views, Thomas. I enjoyed reading your previous post. A lot of my views coincide with that of the commentor, Aleeza, and read the dialogue between you two with interest. As for advise on driving, I would say just please be alert, but from what I know of you, I don’t think that’s really necessary. Aw, that’s so nice of you to think that I’m an alert person! Though I think I’m more of an “overly cautious” person than an “alert” person when it comes to driving, but I guess being hyper-aware is better than under-aware. Glad you enjoyed reading the discourse between me and Aleeza even if you didn’t necessarily agree with my take in that post, and thank you for the book recommendation, it looks unusual and I look forward to reading your review. Also, random question inspired by your latest post – have you read the short story A Study in Emerald by Neil Gaiman? I think you’d enjoy it. Forbidden Island is an awesome game! It takes a lot of strategy and planning to win but it’s really satisfying when you do (and really frustrating when you don’t). And I always recommend reading Unbroken by Laura Hillenbrand. Ah, I really enjoyed reading Unbroken! It’s such an inspirational story. Also, I agree about Forbidden Island; my cousin and I have played it together several times now and we always get super excited/frustrated. We’re still trying to beat the game on Legendary. Thank you for reading and commenting. Congrats on getting your licence (as well as the very impressive view and post numbers) Thomas! I got mine a little less than a year ago and while I LOVE driving I may or may not be a pretty bad driver. Haha. I managed to fail The Test 3 times (you can fail 4 times here) and almost gave up the whole thing but my dad convinced me that I can do it (my driving instructor was well… not very encouraging), so while I ended up changing driving schools, I did pass in the end. Like in Australia, one can get Automatic License here (Hungary) too, but most of the cars are stick shift (and really having just an AL, unless you are disabled, is kinda embrassing) and I actually like driving stick. 🙂 Parking though is (still) not my strongest suit. So yeah, other than practice makes it perfect (hopefully…), I have no advice. Happy and safe driving! Glad you were able to switch schools and obtain your license in the end! I feel like one’s self-esteem is put to the test when learning how to drive – comparing yourself to other drivers and all the people you know who already can drive – that a competent instructor is a must. It’s intriguing that driving stick is so prominent in other areas of the world. Thank you for reading and commenting! I hate driving on the most part because over here many of the drivers are crap at driving to begin with and I’m nervous as it is since it wasn’t quite the experience with my dad teaching me. But one tip I can give is to memorize the contraptions like the blinker and windshield wipers and stuff, you don’t want to be caught in busy traffic or bad weather and forget those. Aw, I’m sorry that you feel nervous while driving; dealing with other drivers on the road is one of the most difficult aspects of the entire experience. Your tip is super helpful because it is always a good thing to have some techniques on call through muscle memory, especially if stressful circumstances do occur. It’s great that you got to go to B&N twice when you were on holiday! Do you have access to a car to drive? Thank you for reading and commenting, Devina. Yeah well … My dad and uncle use the same car and between the two of them I don’t get much of a chance, but it’s not that I’m enthusiastic about it, I just want to know how to drive in case of an emergency.